Ruth is a Community Nurse, currently working with Christian practices in Greater Manchester. She is married to Philip and has 3 children, all of whom are now married. The children were largely brought up in East Africa, where Philip and Ruth served with Mission Aviation Fellowship for over 7 years. Ruth lost some of her heart to Tanzania and has continued to visit there regularly since leaving. Philip and the family, Simon and Emily, Naomi and Neil, Sarah and Gareth, have also returned for visits to Dodoma. She has supported God’s work there for many years, as she can see the amazing effect of Jesus’s love on the whole community. Lives have been turned around, people healed, trust been built and love just seems to gently pour from the Church there. She especially loves the House of Prayer at Samson’s church. 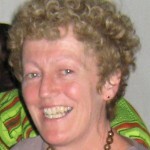 After joining others in giving financially through various ways for many years, she joined with Alan and Liz in starting the Tanzania (UK) Trust. Ruth enjoys her family, gardening, reading whilst munching chocolate in bed, and being with Jesus’s family in Hattersley and Tanzania.